In our instant age of immediate information, tweets, snaps and Amazon Prime, our ability to wait for anything has become almost unnatural. We are conditioned to having what we want quickly. The world of home renovation and furnishings are no exception. Our televisions are filled with programming that suggests home transformations and design projects can be executed in what feels like a 60-minute television segment discoloring our expectations of how construction and interior design actually work in the real world. We in the design realm inherit the task of having to re-program our client’s understanding of timelines and steps involved to professionally appoint a space. 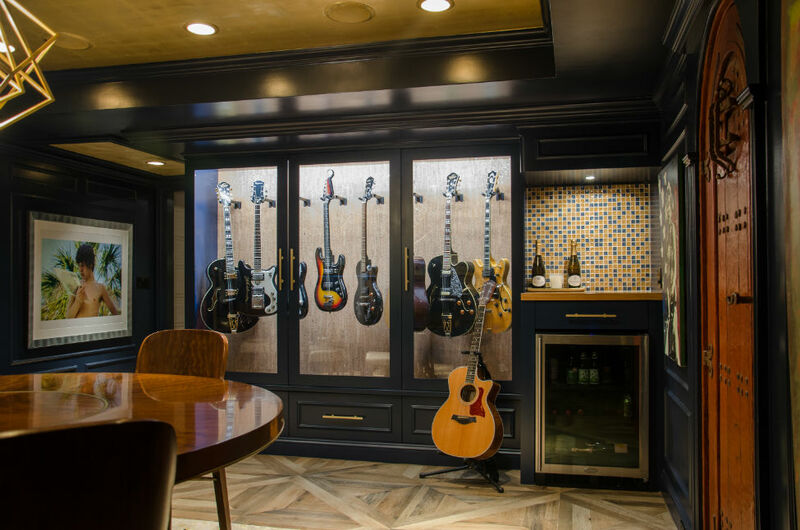 While we can certainly go to a retail store and order and receive furniture in relatively short fashion, a customized and personalized design installation takes time. There is time to collect data and understand our client’s needs and aesthetic; time to design and create; time to source and verify; time to have it carefully manufactured to those specifications, and time to have it shipped and installed. For my very first blog, I felt it would be valuable to share my perspective on what is really involved and how I map out this journey from introduction to completion with the unavoidable and potential bumps along the way highlighted as well. An initial Verve Design consult is complimentary. I view this meeting as an opportunity to not only understand better the scope of work, but to also get a feel for the client and for the client to get a feel for me. Given the time involved, it is important that there be an easy rapport between the client and the designer. I have learned the hard way that is sometimes better to not accept a job that might not be a good fit than to try to be everything for everyone. This meeting allows us to speak in general terms about lifestyle, aesthetic goals, practical needs, financial expectations, and so on. Following this initial Data Collection Phase, a written proposal for my services is prepared that outlines the scope of work in detail, payment structure and an approximate timeline for completion. Ideally, this proposal is then presented in person for review together with additional supporting documents in order to provide as much information as possible for the client’s evaluation. Should the project bid be accepted, a third appointment will be made to measure in detail, photograph, establish collaborative private folders on social media for shared images to be exchanged, the completion of a ‘Getting To Know You’ document, and finally to discuss further any other points of evaluation that need to be considered. For me, locking onto my client’s aesthetic and functional bandwidth is the most critical part of the design process. Realizing and enhancing my client’s aesthetic is the cornerstone of my design philosophy. We are all different and so should be our interiors. They should reflect the client’s taste and sensibilities, not mine. To that end, the collection of data in this Exploration Phase is essential and not something to be skimmed over. To ensure that we are on the same page, I may prepare an illustrative or physical mood board that will reflect the tenor, elemental and palette inspirations of which I am considering. This is usually a couple of weeks. Upon agreement of that or any necessary revisions to the inspiration, the Design And Sourcing Phase will begin. In this phase, designers are hunters and gatherers and it generally accounts for the bulk of my time. 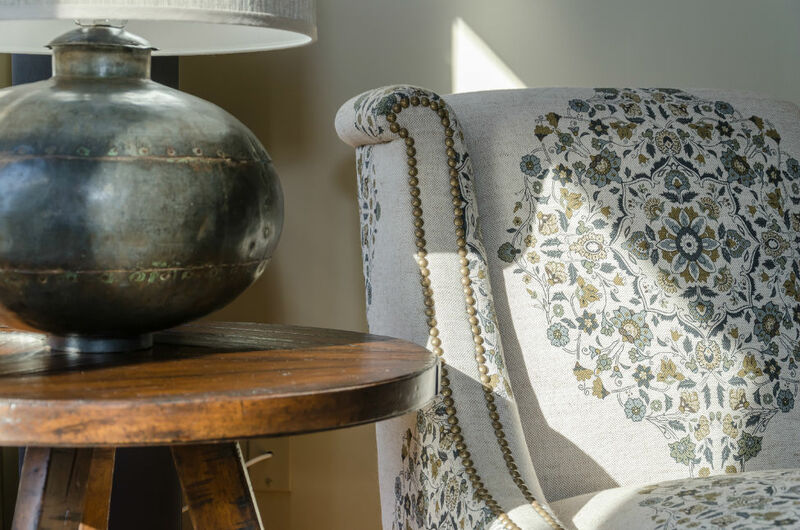 It is the creative explosion where floor plans are rendered; product ideas are created or sourced, and edited often times with the aide of my manufacturers and workrooms. Fabrics and trims are scoured for via multiple outlets, collected and deliberated upon in the greater context. Pricing is fine-tuned and substitutions made as necessary to be in alignment with the budgetary guidelines where necessary, all in an effort to achieve the ultimate balance of form, scale, light, color, and value. I am both creator and devil’s advocate and the art of restraint and editing is as important as that creative explosion. It is a thoughtful, deliberate and time-consuming process with a responsibility that I do not take lightly. Once I am satisfied with the result, I will prepare the physical presentation board, the graphic presentation, the final floor plan and the Proposal which details out the specifications and pricing for each item. If multiple rooms are at play, I typically do a board and presentation packet for each room. This process takes weeks and a lot depends upon the amount of product design and customization that is being considered, as that requires a lot of collaboration and communication with vendors to arrive at final designs and price-points. One of my great loves and strengths has always been product development and sourcing. In my opinion, investing in a designer should result in a space that is uniquely and inherently yours. What better way to showcase that than to have a product designed expressly for your needs and aesthetic. This is where our value of designers lies and the part that gives me such personal joy. Depending on the scope of work and the timely responses from manufacturers or their sales reps, this process can be anywhere from three to eight weeks. It will be presented to the client in person and any necessary tweaks and reselections will be again evaluated and re-submitted. Typically, the careful investment of time on the front end during the data collection phase minimizes the amount of changes that need to take place and the final edits are usually—and hopefully—pretty small! Upon Final approval, a signed proposal and deposit are submitted to initiate the Execution Phase of the project. Here, purchase orders, work orders, and all necessary documentation and purchases are made to book the production and services of products and installers. During the sourcing phase, all of the products are methodically entered and built into a project management software platform that streamlines the execution of proposals, invoices, purchase orders, and work orders and payment receipts. A vertical accounting based project management platform is a faster and more streamlined way to process all the manufacturing documents that support product development and sourcing. Ninety-five percent of the products I purchase are wholesale or trade direct. If a customer has a specific retail purchase in mind, of course I will support that, but I work with an extremely large network of manufacturers that I have developed for the last twenty fours years that I trust and believe in. Typical lead-times for manufacturers take six to fourteen weeks of production. That is a large spread, but it really does vary between vendors with the norm usually eight to ten weeks. This is the phase where things can happen and delays can occur and it can get a little tricky. If you are using a “COM” fabric, Customer’s Own Material which is not part of that manufacturer’s fabric library, the vendor will typically not book that production window until all the COM fabric or trims have arrived into their plant. So if there is a delay from the fabric mill or fabric supplier, there will be a delay in your production. Usually I will request a fabric approval before the fabric is released to the manufacturer to make sure the dye lot is consistent with that which I have on my memo that was presented on the board. If that approval sample arrives in and is different, there is then a process of re-selecting a new dye lot or making a change if necessary. This happens occasionally, not going to lie. 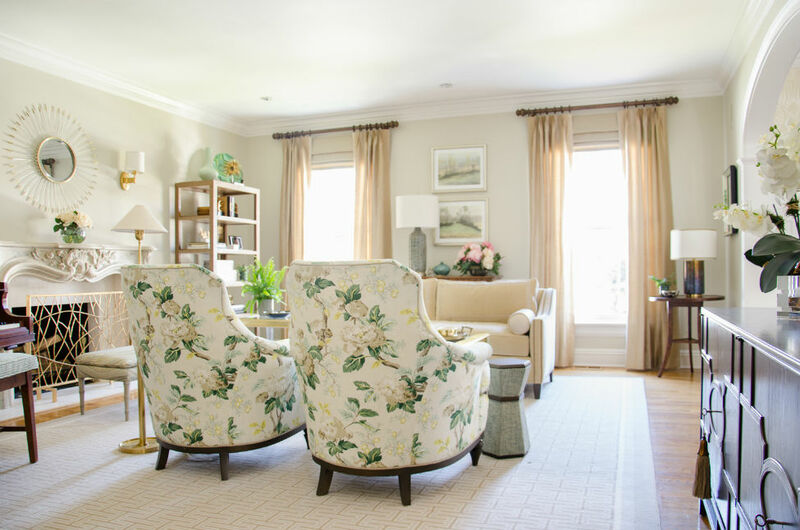 Occasionally a workroom or installer yardage estimates for a fabric, trim or wallpaper run short and more is needed to be ordered to complete the project. Again, dye lots need to be matched and yardage ordered and delays can occur. And these are just a few scenarios that can result in delays or changes. As a designer, I do my very best to minimize problems by being communicative, organized and efficient. There are so many links in the chain and things simply go wrong on occasion. I always tell my clients now that I cannot promise that there won’t be unexpected circumstances that arise or mistakes made. It is not a perfect process, but I can promise to work to resolve them quickly and to the best of my ability. The answer lies in being resourceful and resolute and that is what I can sincerely offer. Once the production begins to ship, we begin the Installation Phase. Most furniture from manufacturers needs to go by freight as opposed to UPS, FedEx or DHL. These freight companies typically deliver to a commercial receiver who will inspect, consolidate, store and then provide the White Glove Delivery service to the client’s home when ready. Again, on occasion, products arrive damaged to my warehouse and in this event, returns and replacements are executed quickly with the vendors. Once all or most of the products are delivered to my local commercial receiver, I will schedule the installation with both the client and the receiver. Typically this process from the point in which it leaves to factory to the receiver is about one week and usually it then takes a minimum of one week to schedule delivery once the product is received. So it furniture takes 8-10 weeks on average, you must add at least two weeks on for delivery and installation. On Installation Day, I will be at the house to meet the delivery truck, often with a car filled of accessories that have shipped directly to me. While there may be other smaller installations of cabinetry, wallpaper or paint, fixed lighting, etc., the Furniture Installation day is obviously the most exciting day of the project. There is absolutely no greater professional satisfaction for me than a client’s happiness with the final outcome. Finally, at that the conclusion of the project, I will schedule a closing review to identify any punch list details that need finishing or final edits and additions and overall evaluation of the project. I may also arrange for photography. When you account for all of these phases, you can clearly see that a professionally designed space appointed with customized furniture will take at a minimum six months and it can certainly be much longer if construction and renovation are involved. 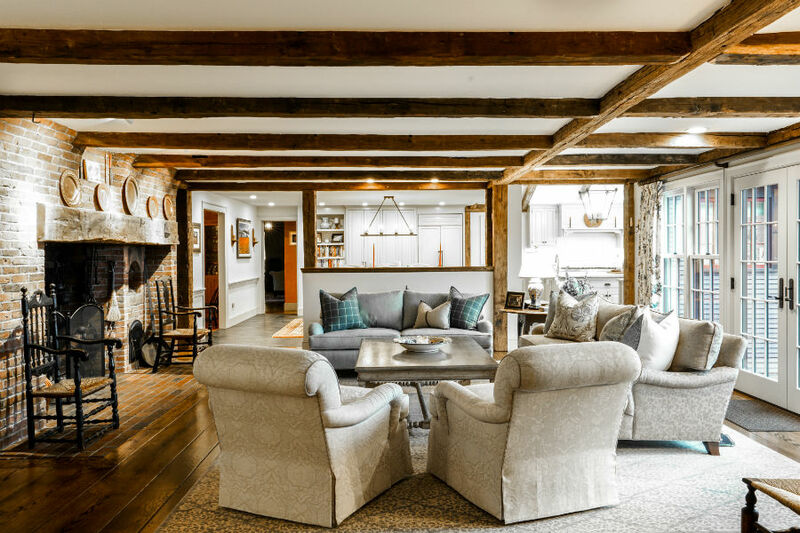 Transforming your home is not a television production set filled with MDF boards and crews of workers on a payroll, nor is it a modern miracle to be erected, but it is a significant investment of time, money and energy. To do it right, you need to approach it right… with an understanding and a mind set of what you are about to embark on.